IAS 1:117(b) Disclose accounting policies that are relevant to understanding the financial statements (i.e. those for material items). Types of warranties and related obligations. The transaction price and the amounts allocated to performance obligations (see Paragraph 126). An explanation of why the methods used provide a faithful depiction of the transfer of goods or services. IFRS 15:125 For performance obligations satisfied at a point in time, disclose the significant judgements made in evaluating when a customer obtains control of promised goods or services. Under IFRS 15, revenue would have been recognised evenly over the four year period (CU 500,000 in each year). 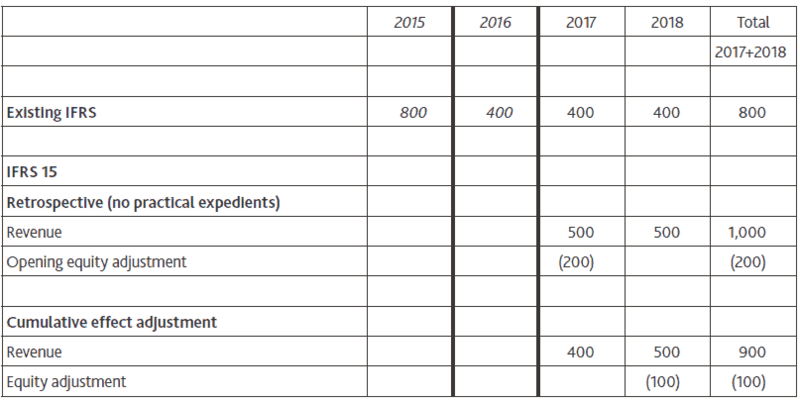 The retrospective equity adjustment of 200 is calculated as the difference as at 1 January 2017 between the cumulative amount of revenue recognised in accordance with existing IFRS (1,200, being 800 in 2015 and 400 in 2016) and the amount that would have been recognised in accordance with IFRS 15 (1,000, being 500 in each of 2015 and 2016). The cumulative effect adjustment of 100 is calculated as the difference as at 1 January 2017 between the cumulative amount of revenue recognised in accordance with existing IFRS (1,600, being 800 in 2014 and 400 in each of 2015 and 2016) and the amount that would have been recognised in accordance with IFRS 15 (1,500).